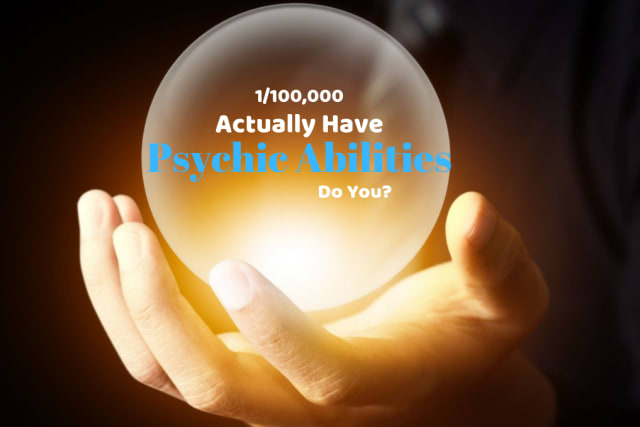 1 in 100,000 Actually Have Psychic Abilities - Do You? Psychic abilities are not fully understood by today's science. One day, future minds will better be able to tell what senses psychics are tuning into. Find out if you have psychic abilities by taking this quiz. How often do you feel overwhelmed in crowded areas? How often do you have dreams which you can recall with nearly perfect detail the next day? Did you have an imaginary friend or friends during your childhood (or as an adult)? Do you ever notice people appear to be "glowing" to you? Or do you ever see orbs of light in the sky or a room? Do your friends feel comfortable coming to you with their problems? How often do you find yourself worried about a future event but are unable to express your concern in words? Throughout your life span, how many times have you narrowly avoided a potential disaster? How do you respond around angry people? How often do you experience Deja Vu? Yes, you are psychic but you probably already knew that. You are not psychic, which is partially why you didn't already know that about yourself.